I press "g" and nothing happens. You can test in your game? Which of these looks like the surrender key? 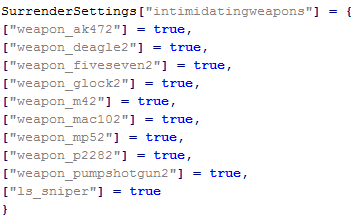 And have you made sure to open up the config file and add all the weapon names to the "intimidatingweapons" table? How would you make it so police officers can't make each other surrender? Thanks! Also I love this addon! I can't shout. I tried using my regular m9k weapon, (I reversed the table), I tried using one of the default guns, then I tried changing the true to false on a default gun and it still didn't work. Any tips? For some reason, I can't surrender. I push all the combonations. I also take out the Default RP weapons that work for other people but it won't work for me. Any suggestions? Are you standing still and not crouching after having hit the combinations? If so, and it didn't work, try entering surrender_surrender into your console and see if it does anything. Can you change the surrender key? Cant BE killed while tied? May I just ask, What is "Weapon_lordi_rope" caught my eye got me interested. Sorry, you can't change the keys for the surrender prompt, you can change the shout key personally for yourself though using the spawnmenu. Not being killable while tied is an issue caused by using Player.Lock, i'm not going to change it though. Kind of self explanatory, isn't it? Anyway, it's just an example to show off how to use the "Can" functions in the config. So it's not a real thing? Dam that would have been cool. Hi, So after using this for a long time I was wondering if you could assist me with changing this us a bit. Instead of am trying to make it so you can press a key and put your hands up for infinite amount time. and then also make it so hands are behind back when you get handcuffed. Are you able to assist me with doing this or shall I post on the forum about it? Can you use this in sandbox or just DarkRP?